Home » Football » You May Have Russell Wilson Rookie Cards, But Do You Have His First Card? You May Have Russell Wilson Rookie Cards, But Do You Have His First Card? Coming out of spring training, there's a lot of buzz around the Seattle Seahawks and their rookie quarterback, Russell Wilson. Since being named the team's starting QB, Russell Wilson rookie cards have soared on the secondary market. He's now in the top tier of the 2012 rookie class, behind Andrew Luck and Robert Griffin III. Over the course of the season, collectors will have a chance to collect more than 30 Russell Wilson rookie cards. But did you know his first licensed cards came out nearly two years ago? He had cards in 2010 Bowman Draft Baseball. Wilson is also an excellent baseball player. He was drafted out of high school by the Baltimore Orioles in the 41st round in 2008. 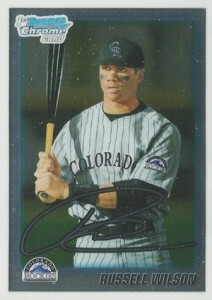 After going to college, Wilson was picked once again, this time in 2010 by the Colorado Rockies. This time he moved up to the fourth round. Wilson made his way to Class A Asheville in 2011, making a less-than-stellar showing at second base. He hit just .228 with three home runs. That winter, Wilson abandoned baseball to focus on football. He led the Wisconsin Badgers for the 2011 NCAA season. Wilson has several cards in 2010 Bowman Draft, all of which are listed below. These cards will likely be a novelty, similar to Michael Jordan and Danny Ainge baseball cards. Should Wilson have an excellent career, his baseball cards will hold some value, but never as much as his football cards.